What’s happening at St. Paul’s and in the community! Quilters and Crafters plan to meet once a month, bring a project, work together on a project, do a community or outreach project, whatever you choose! The Friendship Room is booked 10-3. Bring your lunch or coffee and goodies to share. Conversation and advice is free! If you want more info call Carla at the office or Gail Schau or Sherry Alstad. Revelation. The last book of the Christian Scriptures and a very challenging book to read. We will be having a 7 session study on the Book of Revelation on Wednesday afternoons at 1:30 starting on March 13 and running to the end of April. Gloria Powell as she shares her El Camino Journey with us. The Youth Group is again collecting items for our blessing bags that we will make in the spring, please consider donating. A list of suggested items is on the bulletin board at church. The first Sunday of each month there is a second offering that is dedicated to local outreach. This past month from February 1-28 we gave out 12 food / gas vouchers for a total of $650.00 from our local outreach fund. Please consider donating “in good used condition” warm clothing such as mitts, gloves, socks, toques and bath towels for the Saint Lawrence Center. Thank you for your continued support. The main goal of this choir is singing to maintain and improve vocal heath. As we age, we need to work to keep our voices strong. We just happen to have a lot of fun singing together while we do it! Free to join & everyone welcome! St. Paul’s has an easy fund raiser to help with the Church renovations. All you need to do is bag up all your empty bottles, cans and milk jugs and put our church id # 1468-2415 visible on each bag and drop them off at the bottle depot on Resources Road and before you leave, check in with the cashier and let them know how many bags/boxes or bottles/cans you dropped off. The Communications Team is always looking for photographs! If you have any photos of recent St. Paul’s events, please forward them to Carla for use in newsletters, narrative reports etc. Please let us know how we are doing with our messaging on the LED sign; in the Newsletter; on Facebook; and/or on the St. Paul’s website. Would you like to put an announcement in the Sunday bulletin? 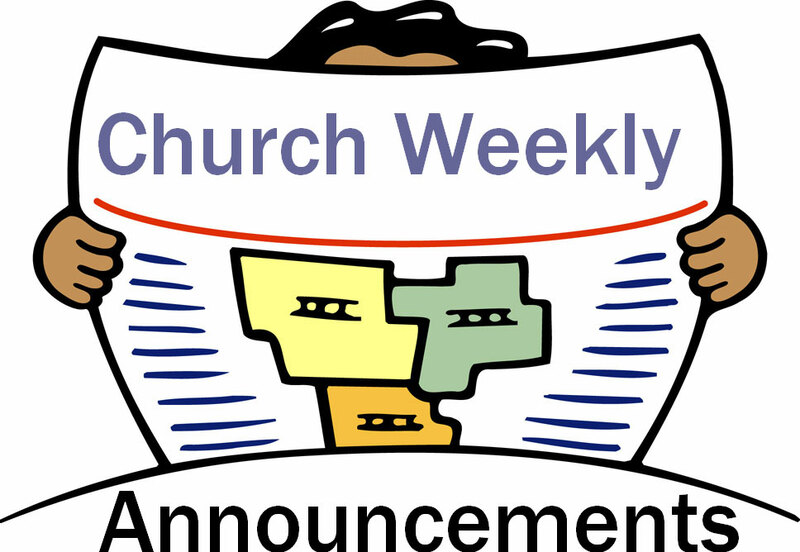 Please have them to Carla in the Church office by Thursday’s at noon in order to have them in for the current week’s bulletin. Offering Envelopes – Making your donation using a set of offering envelopes is the easiest way to ensure you receive a tax receipt for your givings. If you don’t have a set of offering envelopes, and would like some, please contact Carla in the church office. We are in need of Scripture Readers and Door Greeters every Sunday. Please sign the lists in the foyer if you would like to volunteer to help during the worship services. PLEASE be sure to check with Carla in the church office before you expect a room to be free for your use. Rooms booked with Carla in the office will have first priority. Labyrinth Walks Join us for meditation and an inward journey on a sacred path. Upcoming dates to be announced. Sunday School is open to all children from the age of three and up to Grade Six. Canadian Girls In Training (CGIT) and Explorers meet at the Church Tuesdays at 7pm.